I have recently joined the 2000+ Club and was awarded the privilege of reviewing Low Quality Posts. Why is this option available while we are recommending a post for deletion? I have always seen the community accepting link-only answers (although the preference is for posting actual answers and providing links for acknowledgement). We do not delete link-only answers. Or, my understanding of Recommend Deletion button is flawed — It doesn't send the Reviewer's suggestion of deletion to Moderators and we still need to flag answers (me too, thank you, different question etc.) for them to get deleted. (To clarify, my present understanding is that pressing this button acts like as we are flagging posts for Moderators to delete them - we do not need to raise additional flags for moderators). This post is in the process of being revised and updated to make it more useful to readers today. However, it is still mainly about a change introduced in 2012. Most of the network is less tolerant of link-only answers than AU. I believe the primary reason for this is that the canned comments offered in the Low Quality Posts review queue are network-wide, and the culture surrounding link-only answers (answers that are not an answer without the link) on Ask Ubuntu is different from the dominant culture on the Stack Exchange network. Or at least different from the attitude toward them on Stack Overflow. The dominant view on Stack Overflow and probably the network as a whole is that link-only answers are rarely if ever answers and should usually be deleted even if they don't have any other problems (such as the link being broken or linking to a source that doesn't obviously answer the question or is not in English). How should I flag/downvote answers/questions that are just links without summaries? And all the answers to How should helpful answers that are just links be handled? So as George Stocker ♦ suggested when I discussed this with him, maybe the community consensus here really is that link-only answers should usually be deleted, after all! Some answers that shouldn't be flagged can still be delete-voted. Another important consideration is that sometimes, even when an answer should not be flagged, it may still be reasonable to vote to delete that answer. This relates to your whole question--it is a second reason why it makes sense to have a canned comment for link-only answers in the Low Quality Posts review, perhaps even on Ask Ubuntu and even if we on AU take a relatively accepting attitude toward link-only answers. The more accepting view of link-only answers is that they should often/usually not be deleted and that moderators should not delete them. But that doesn't mean the community shouldn't vote to delete them. It raises the post higher in the Low Quality Posts review queue, where users with 20k reputation who can click Delete will see it sooner. And, of course, moderators can and do also see delete votes (and may consider them along with flags and other indications of the community's views about a post, which moderators take into account along with their own views about whether or not the post belongs on AU). If 6 users select Recommend Deletion while reviewing that post, the post is deleted, even if it didn't get any 20k delete votes. A flag is, in principle, a request for a moderator to make a decision and act on it. When the review system was introduced and for some time afterwards, including when this question was asked, it had not yet replaced the old 10k "mod tools". For not an answer and very low quality flags, moderators would usually wait for some 10k users to help them out by evaluating and expressing their views on the flags by either agreeing and flagging them themselves (adding weight) or disputing them (which was in effect a way of counter-flagging). Still, the fate of every moderator attention flag--which didn't include some kinds of flags, such as flags to close questions--was for a moderator to exercise their authority. The system has evolved since then, and most not an answer flags as well as many very low quality flags no longer have to be handled directly by moderators, but it is still the moderators' job to step in and handle flags that are not being handled, or when they otherwise see fit to do so. Anyone who can review Low Quality Posts can Recommend Deletion. Once a post is removed from the Low Quality Posts queue, among other things, this substantially decreases its likelihood of being delete-voted, as a 20k user would have to find the post on their own, likely by chance (though perhaps while browsing the "delete" page in the 10k tools), and decide it was worth voting to delete, and it would have to have a negative score. Thus, it's quite reasonable to think there are posts where whether or not they should stay is too subjective to justify flagging them, or where they should be deleted but don't fall under any of the established flagging reasons. To clarify--one of the established flagging reasons is "needs moderator attention." This includes custom moderator flags. What I'm suggesting is that there are some posts that merit deletion but don't need moderator attention (i.e., aren't not an answer, aren't very low quality, and don't otherwise merit raising the attention of a moderator using a custom flag), and also don't fall under either of the other flag types: spam and not welcome in our community. The not an answer flag means the post is not even an attempt to answer the question. (Occasionally it might mean that it is an accidental attempt to answer a totally different question, or that the author entirely misinterpreted the question). Answers that are totally wrong don't qualify. Answers that are malicious, that violate the promotion policy (whether or not they're actually spam), or that present bad techniques that are so deeply and immediately dangerous that even a comment won't sufficiently mitigate the danger should be flagged, typically with a custom flag explaining the situation to moderators. (Or if they're spam they should be flagged as spam.) But just really super-bad answers are still answers. Like the NAA flag, the VLQ flag is not for posts that are totally wrong. Downvoting is for wrong answers; flagging is not. For situations where it's clear a moderator should delete the post, but none of the provided flagging reasons apply or would clearly draw attention to what's wrong with the post, a custom flag should always be used. But what about situations where the post contributes nothing, but the situation doesn't merit moderator intervention? An answer is badly written, explains itself poorly, and/or doesn't explain itself at all. Another answer explains the same thing well, so the bad post doesn't contribute at all. An answer contains exactly the same advice as a previously existing answer, and doesn't present it in a way that provides any advantages. An answer is not just totally wrong, but also hardly comprehensible, and without the help of its author (which has not been provided), it cannot be interpreted well enough to figure out exactly which totally wrong thing it is saying. Still, some small parts of it are clear in what wrong thing they are saying. The same answer has been posted in multiple places. In one place it is clearly helpful, but in another it is only marginally useful and the OP has expressed that it didn't work. Even if it had worked, a comment pointing to it in the other question would have been sufficient. In all these cases, we have a post that is an answer and can reasonably be interpreted as not very low quality. A moderator should probably not be called upon to delete it, though it wouldn't necessarily be wrong if one called upon him/herself to do so. These posts probably shouldn't be flagged but can still be deleted by voting/recommending to delete. Almost always they don't explain themselves at all, so if there's a better answer that conveys the same material, they cease to be valuable. Often a link-only answer links to a post that gives the same advice as another answer to the question. Often it's not clear how the information on the linked page would help, and there are plenty of ways to interpret it that are wrong or irrelevant. Or the linked page has moved or changed so it's no longer a good answer. The same link-only answers are often posted on multiple questions. 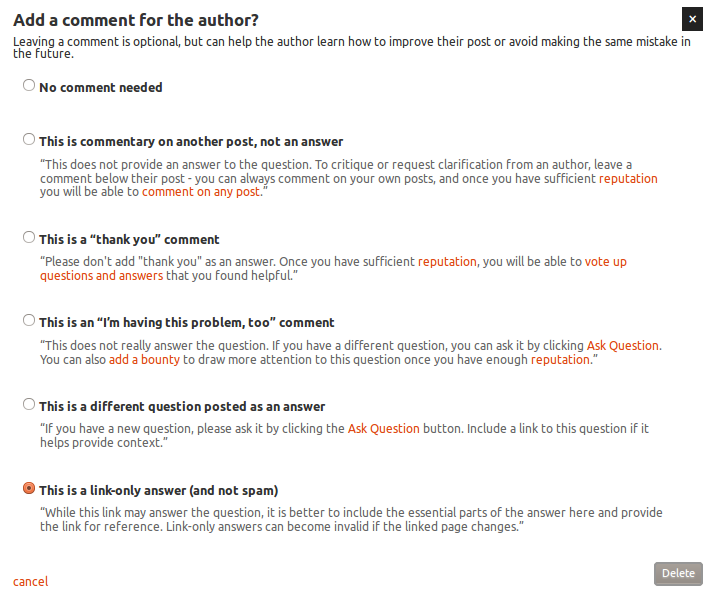 And even when they are not, often multiple users post link-only answers with the same link, on multiple questions. In conclusion, it makes sense to have an auto-comment for link-only answers in review, because it sometimes makes to delete a link-only answer even if it shouldn't be flagged. A note on flagging: Even though clicking Recommend Deletion in the Low Quality Posts review queue doesn't have the effect of the post being flagged, when you think a post does deserve flagging, you should feel free to open up the post and flag it, too. Not the answer you're looking for? Browse other questions tagged discussion support answers review . What happens when I vote to delete an answer?